Cabot Investment Properties LLC and its principals, Carlton P. Cabot and Timothy J. Kroll, allegedly stole more than $5 million from Massachusetts residents. A civil RICO (Racketeer Influenced Corrupt Organization) complaint has been filed against Wells Fargo, US Bank and two other entities in the latest wrinkle in a complex financial case involving investors. 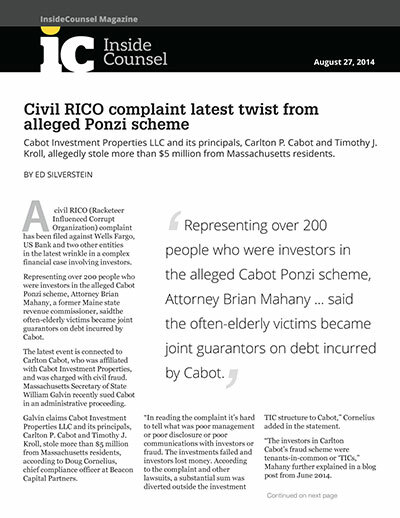 Representing over 200 people who were investors in the alleged Cabot Ponzi scheme, Attorney Brian Mahany, a former Maine state revenue commissioner, saidthe often-elderly victims became joint guarantors on debt incurred by Cabot. The latest event is connected to Carlton Cabot, who was affiliated with Cabot Investment Properties, and was charged with civil fraud. Massachusetts Secretary of State William Galvin recently sued Cabot in an administrative proceeding. Galvin claims Cabot Investment Properties LLC and its principals, Carlton P. Cabot and Timothy J. Kroll, stole more than $5 million from Massachusetts residents, according to Doug Cornelius, chief compliance officer at Beacon Capital Partners. “In reading the complaint it’s hard to tell what was poor management or poor disclosure or poor communications with investors or fraud. The investments failed and investors lost money. According to the complaint and other lawsuits, a substantial sum was diverted outside the investment TIC structure to Cabot,” Cornelius added in the statement. “The investors in Carlton Cabot’s fraud scheme were tenants-in-common or ‘TICs,” Mahany further explained in a blog post from June 2014. The TICs were income-producing securities, and come about as the Internal Revenue Service allows investors to pool money. “Here, the TICs not only invested their own money, many unwittingly borrowed money and signed personal guaranties,” Mahany said in the blog post. Galvin also cautions that Cabot came up with a “non-existent relationship with Cabot Properties,” according to news reports. Cabot Properties is a Boston real estate and development firm, Galvin said. Meanwhile, the new case involves alleged racketeering involving wire fraud, mail fraud, and money laundering, according to court documents. It's a cross complaint and was filed in Hartford, Conn., Superior Court. Mahany claims that borrowers, most of whom are elderly, had accounts that included their life savings. Allegedly, the conspiracy left the borrowers with nothing. The case claims US Bank, Wells Fargo and CW also failed to advise the borrowers of defaults under the terms of loan documents. Nor were they informed of theft and diversion of funds. Fees were high as well. In the second conspiracy, cross-defendants tried to seize control of the property. The plaintiffs are seeking damages, punitive damages and attorneys’ fees. As of June, various state and federal authorities were investigating Cabot’s actions.